In the six years since I was first diagnosed with cancer, had my first remission and than the return of that cancer my faith and courage has been underscored countless times. I have had the privilege of walking through this journey with women who are healing or have healed from excruciating losses and health challenges as well as those struggling through dark nights of the soul. These same women have walked with me as I grappled with similar experiences. Together, holding hands as we bared our hearts and souls to one another. Our journey has taken us through the fires of hell to the mountaintops of light and joy. No matter what tribulation or negotiation I have had to navigate through my medical procedures I have felt their love, their compassion for me. No matter the darkness on disillusionment, despair, depression these sisters, my personal heroes have helped me to regain and keep my equilibrium in this ongoing fight with cancer. Through my struggles I have gained valuable insights and deeper compassion for them and others who are or have been part of my ever increasingly growing orbit. I feel sometimes that I am the float on the Fisherman’s line, that even when I am seared by sorrow and shrouded in darkness That eventually I bob to the surface, bringing with me valuable insights and ever increasing compassion for myself and others. Each time I bounce back (sometimes it’s a low, slow bounce) from one more challenge, I become more deeply aware of how inherently courage’s and wonderful these wise women in my life are. As a woman of courage I must let daffodils bloom in my heart, have the wisdom to absorb the joy of everyday miracles that surround me. I must find the ability to create a place where love, joy and laughter abound. And most of all when my friends and loved one shower me with compassion, encouragement and support. . . I must not struggle I just need to bath in its warm glow. I Am Strong and Capable. I Can Do What Ever I Set My Mind to Do. I Am Filled With Strength and Confidence. I'm always lifted up after reading your posts. Thank you. 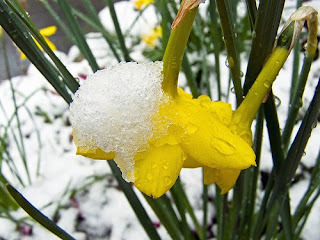 Where did you find that beautiful picture of the frosted daffodil? Another beautiful, thought-provoking analogy. You're one of my heros, Thressa! Thanks So much for telling us your feelings, I love the picture.. Did you take it? Your an amazing woman and as Chelle said, your such a hero to so many of us.